PRINCE2 provides you with greater control of resources, and at the same time will give you the ability to manage business and project risk more effectively. PRINCE2 is an established project management framework that is part of the Best Management Practice (BMP) portfolio of frameworks. The BMP family is formed by a large group of management and delivery frameworks that have been constructed from industry best practices covering wide areas of topics such as portfolio, programme, projects and service management. PRINCE2 is a project management methodology specially designed to be generic, scalable and most important independent of any product development method or any particular project type. It is a method that mainly support organizational control over project investments. It has built in several components: a process model, supporting knowledge areas and predefined roles and responsibilities. On the other hand it is a pragmatic methodology as it regards estimates of cost and benefits as always carrying a level of uncertainty that needs to be acknowledged and dealt with. 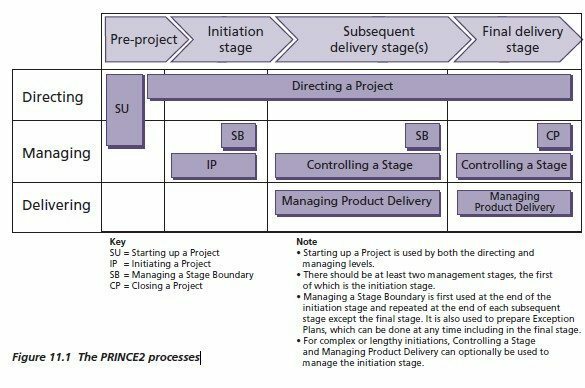 PRINCE2’s precursors, PROMPT and PRINCE, mainly focused on Information Technology (IT) projects. Actually they were very similar to the waterfall like structure. In 1996 PRINCE2 had been reworked so that it would be suitable for any kind of project. In the course of the rework the waterfall characteristics have been removed as they would not fit every kind of project. The conclusion drawn was that only an iterative and incremental approach would make sense. The principles lay the foundation and all other elements build on top of that and help achieve them in a practical way. The themes have the role of offering best practices on every project area of concern. The processes present the way of managing the project. Finally the manual presents advice on how to use the method in diverse environments since all projects require answers about the project size, importance, complexity and risk etc. The figure underneath presents the PRNCE2 processes and gives on overview of the framework. Resulting that PRINCE2 can handle temporary initiatives but it does not try to cover every type of development environment. 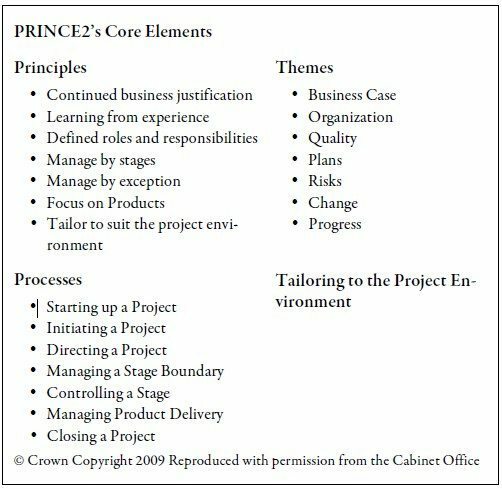 On the other hand PRINCE2 focuses on project management. It handles the product development and its delivery as work inside its process model with little emphasis. How does the delivery planning and work actually happen? How do the teams organize their daily work? How do we embed change control in the practical development work? Requirements are not understood completely before the project starts. Users usually decide on what they want after they see the initial version of the product. Requirements change very often throughout the software construction process. New tools and technologies make implementation strategies unpredictable. Many projects have encountered one of this issues and that resulted in an ineffective method. This predictive method cannot cope with the fast changing environments. There is need for a much adaptive approach to product development. Most software development project cannot be planned upfront and Agile is a more flexible way of accomplishing the project objectives. It uses Sprints (short cycles) to add maximum value for the client. When we talk about PRINCE2 one of the main points that surface is that it can be used for any project regardless of sector, industry, size, risk, or complexity. Its essence is the ability to scale and tailor the method based on requirements. Project Assurance. In effect, independent (of the project manager) health checks of the project, focusing on guidance rather than just auditing. PRINCE2 does not cover contract management nor people management. These are however covered by the project management body of knowledge (PMBOK) developed by PMI (Project Management Institute) for US and by the APM (Association of Project Management) in the UK. Can be rather difficult to implement, even though it can be tailored many organizations have trouble identifying the right level of detail necessary. What is your view on PRINCE2, is it something you would like to learn, practice or implement? Post your comments below.